Huge FairTax Rally in Columbia, MO on June 13th!! The following is the latest news from FairTax.org Man I wish I could go to this! It’s known as the “Show Me State,” and when it comes to the FairTax, Missouri is just that. Our friends in the American heartland have taken a big lead in pushing the FairTax movement forward, with the Missouri House of Representatives passing FairTax legislation which would replace their state income tax structure with the FairTax. To show your support for the FairTax there and especially in Washington to replace the federal income tax system, we hope you’ll consider making a special trip to join us in Columbia, MO on Saturday, June 13 for the huge Midwest FairTax Rally. Yep, that’s a haul for many, but this rally alone could draw 20,000 or more so we need you there. The Midwest FairTax Rally promises to be a huge, all-day FairTax event at the Boone County Fairgrounds with giveaways, music, and of course many great FairTax speakers and leaders including Neal Boortz, John Linder, and Herman Cain! Volunteers are also needed to staff the Rally so that new-comers can learn how the FairTax will bring real change and real economic stimulus to our country. Most volunteers will need to be in Columbia Friday morning for orientation and set up. Others can arrive very early on Saturday. We have a specific need people with laptop computers to help register people as they arrive at the rally. If you can help, please email fairtaxgeezer@yahoo.com with “registration help” in the subject line. To learn more, and to the RSVP for this important rally, please go to http://www.midwestrally.com. Again, thanks for all you do to support the FairTax cause, and I hope to see you in Columbia on June 13. The following is the video of the Special Order on the US House floor on the FairTax this afternoon. Cliff Stearns spoke before the Special Order and his speech is not included in the video. Yesterday I attended my first county GOP Convention. It was a lot of fun and I enjoyed it immensely! It ended up being a long meeting but it was worth it at the end of the day! After getting up early to head to Collins Hill High School, I made my way through the rain into the right building. I ran into many people I knew from the county GOP breakfast I had attended last week. I had help getting to the right registration table. There was quite a line and it was somewhat disorganized. However I made it through. By the time I was done my friends with Team Oxendine were already hard at work and things pretty well covered. So I made my way towards the theatre where the meeting was going to be held. On the way I ran into Commissioner John Oxendine and talked to him for a few minutes. He voiced his support for the “Can-Do Conservatives of America” and pledged to help in any way he could. After meeting John on several occasions, I finally got a chance to get a few pictures taken with him. You can see one of them above. It’s always a pleasure to meet with him. I’m proud to represent John! Also speaking at our convention was my US Rep, John Linder, Commissioner John Oxendine, a very brave Charles Bannister (he’s our infamous county commissioner and definitely not the most popular man in the room, let alone with myself), Lt. Governor Casey Cagle (also running for Governor and spoke to us very late), and a few other candidates for high office next year. Next up were the heads of the different committees. We were told that we had about 250 delegates at this convention. It was the highest number of delegates in several years. The only other big turnouts were in 2001 (before we swept the 2002 elections) and 1993 (after Bill Clinton was elected). We passed several resolutions including one against the Freedom of Choice Act (FOCA) and one in support of state sovereignty (10th amendment). Everything was going smoothly until we were met with the rules committee. The resolutions committee was very organized, had handouts at the ready, and showed the resolutions to everyone in a power point presentation. No such luck with the rules committee. This caused several rounds of questions about the rules changes and much confusion. After 25 minutes a measure was made to postpone the rules committee portion of the convention until the next business meeting. The speeches and committee proceedings pushed us toward the Noon hour. We had not even heard from the candidates for party officers yet so we could vote on them. That took another thirty minutes. Then we were finally let out to vote and caucus to determine delegates to the district and state convention. Based on the number of people in the room compared to the available slots to both the district and state conventions we were all elected as delegates! I did not expect to get farther than the county convention. I am thrilled to death to be able to represent my county, John Oxendine, and Team Huck down in Savannah in May! Congratulations are in order to Chuck Efstration and his team for winning the officer elections. Chuck is the new county GOP chairman for Gwinnett County. He is also my first endorsed candidate at the state level to win office! I am looking forward to being a member of his team to help move the Gwinnett GOP forward to the lead in the state party! My favored candidates for Governor (John Oxendine) and Lt. Governor (David Shafer) both won the straw poll here. John won the straw polls in Rockdale, Cherokee, and Fayette counties too, as well as the vote count from all statewide polls! David Shafer won the straw polls in at least 13 counties. There was more good news from Rockdale County, Mike Huckabee’s campaign chair in 2008 was elected chairman of the party down there. All in all, it was a great day! I was proud to be a part of it. On to the District and state conventions! I support the Fair Tax and believe enacting the Fair Tax would transform our sluggish economy. First, if you will read the chapter in my book “Do the Right Thing” about the Fair Tax, you’ll not only have a clear understanding of what it is but how I ended up becoming an unflinching supporter and how the Fair Tax was developed. It was the result of some prominent business leaders from several states meeting to discuss how to change what they saw as a very punitive tax system that was stifling our economy and making it increasingly more difficult to succeed in a global market. These guys put up their own personal money (no government grants involved) and sought after and then contracted with a team of America’s top economists, which included a “Who’s Who” of leading economic thinkers from Harvard, Boston University, Stanford, MIT, and other top schools and business economists. That team was challenged to do a thorough study and determine the optimum way for the government to receive the funding it needed to operate in a way that would most empower the citizens at all levels to prosper and not punish them. The financiers of the project all thought that the team of economists would come back to them with a flat tax on income, much like the Steve Forbes proposal of a few years ago. What they received back was in fact a flat tax, but not on income, but on consumption. Their proposal, which by design was to be revenue neutral, is the genesis of the Fair Tax. There is over $20 million of academic and practical research behind it. The biggest obstacle to its passage is mobilizing the political will to enact the Fair Tax and it is one of the reasons why I founded the Vertical Politics Institute (VPI). Many armchair political quarterbacks like to speculate about whether I should personally back off support of the Fair Tax, don’t bother. I won’t. I’m convinced we could begin to work out of our economic nightmare if our political leaders had the guts to do something about the Fair Tax rather than create monster debts for our children with unconstitutional bailouts for private businesses. This email is just the beginning of a long term discussion about a very important issue. Look for my email around this time tomorrow discussing what the Fair Tax is and how you can help. PS In February of 2008, during the heat of the campaign, I was asked about the Fair Tax at the Commonwealth Club of San Francisco. This links to an eight minute video of my answering questions on the issue. More food for thought. To learn more about the issues the Vertical Politics Institute is supporting, please visit our website atwww.verticalpoliticsinstitute.com. The FairTax Is Alive In The 111th Congress!! I am extremely happy to tell you that HR 25, the FairTax, has been reintroduced and is alive and well in the 111th Congress. Not only that, the FairTax has been dropped with more original co-sponsors than it has ever had. This is an incredible accomplishment, and it has everything to do with you and the immense passion and work you have put into it. As a citizen co-sponsor of the FairTax you have played an active role in illustrating to other Members of Congress that the FairTax is important to you and is the right step for America to once again regain her prominence. Thank you for that. Our citizen co-sponsor effort has become a powerful tool, as I hoped it would. This means we need to work together to enhance and strengthen it. Our goal in Congress is to reach 100 co-sponsors on the bill, and our goal for the citizen co-sponsors is to reach 100,000. I truly believe that if our citizen co-sponsors can achieve that goal, then that will be the catalyst for HR 25 crossing that 100 co-sponsor threshold. So now is the time, if you haven’t gotten a friend to join the fight, do it today by sending them to www.johnlinder.com. If you already have, thank you; now go try and find ten more. The success of the FairTax to date has been tremendous, and it is all a result of your hard work. It is incumbent upon all of us that we step up our efforts to ensure that the FairTax has not yet reached its peak, but is still climbing. The following is the latest release from John Oxendine’s campaign. It was sent last week and I thought I posted it here but was mistaken. Sorry about the delay. Do note his language. Oxendine is going all in on the FairTax and is trying to ride Mike Huckabee’s coattails to the Governor’s Mansion in Atlanta. I stand with Congressman John Linder, Neal Boortz, and Herman Cain in support of the Fair Tax. I am very disappointed the US Congress has not followed the outstanding leadership of Congressman Linder and passed his historic pro-family legislation. If you honor me in 2010 by allowing me to serve as your Governor, I will invite the nation’s Governors to meet and draft a plan to implement the Fair Tax. I stand with, and support, Governor Mike Huckabee in his national leadership on the Fair Tax. Governor Huckabee has demonstrated true leadership and statesmanship in his principled stand on the Fair Tax. I intend to stand with him as we continue the battle for the Fair Tax. Like Governor Huckabee, I feel that a reasonable tax structure should be flat, fair, finite, and family friendly. The Fair Tax achieves these goals for America. Like Governor Huckabee, I am convinced the Fair Tax will do more to revive our sagging economy than any so-called stimulus package Congress can try and sell to taxpayers. Like Governor Huckabee, I don’t support the Fair Tax just to secure the support of a particular group of voters. I support the Fair Tax because I am confident it will lead to a level of economic security and revival that would be unmatched by any other action on the part of our Federal government. I need your help. I need your support – today. I am not endorsed by the Fair Tax organization. Due to IRS laws, they cannot endorse me. I have had people say that if I support the Fair Tax, I will not have their political support in my campaign for Governor of Georgia. While I certainly respect their opinion and will regret not having their support, I am and will always be solid and sincere in my support for the Fair Tax. I am willing to lose an election, but I am not willing to stand by and allow my children to live under the failed tax policies implemented in 1913 that we still have to endure. America needs the Fair Tax and we need it now. I need your support to become the nation’s first sitting pro-Fair Tax governor. Will you send my campaign a contribution before my 31 December reporting deadline? We have all heard reports of a resolution by the National Governor’s Association opposing the Fair Tax. If you honor me with your financial support, I will be the Governor that changes that. I will be the Governor who campaigns for the Fair Tax and I will be proud to stand with Governor Mike Huckabee, Congressman John Linder, Neal and Herman to promote and fight for the Fair Tax. If you agree, I need your help. Today. Once the Georgia General Assembly goes into Session in early January, I cannot accept contributions until they conclude – typically in mid-April. Your contribution – of any amount from $5 to $5,000 will help. It will allow me to travel the state in early 2009 hosting our Fair Tax Meet Ups. In the next few weeks, the dates and locations will be posted at www.johnoxendine.com for my next series of statewide Fair Tax Meet Ups, but I need your financial support to make them a reality. I am afraid my potential opponents only passively support the Fair Tax. Sure, they may not oppose it, but they are certainly not making it a central message of their campaign. One reason is that many of their top financial supporters actually support massive federal bailouts and oppose Governor Huckabee and the Georgia Republican Congressmen in their opposition to these out of control bailouts. I am proud to endorse the Fair Tax. I have already traveled across Georgia and across America for the Fair Tax. If you supported Governor Mike Huckabee and the Fair Tax in Georgia in 2008, I am your candidate for Governor of Georgia in 2010. Please go to www.johnoxendine.com and contribute as generously as you can so that I can take our pro-Fair Tax message across Georgia. Governor Huckabee Rocked the House At Yesterday’s FairTax Rally! Wow! What a day yesterday! I was really excited about the FairTax rally that was going to be held yesterday at the Gwinnett Civic Center and boy did it ever exceed my expectations! 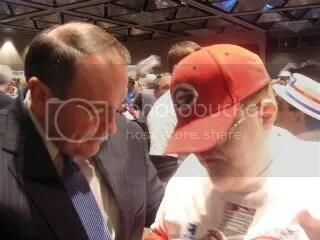 I have spent long hours over the past year working hard for Governor Huckabee and his causes but I had yet to get the pleasure to meet him in person. Finally I had my chance and it turned out to be an unforgettable experience!! When I woke up yesterday morning it was like my Birthday and Christmas morning all wrapped up in one day! My excitement knew no bounds! My ride was scheduled to arrive between Noon and 12:30 to try and beat the crowd and after Breakfast I had no time to lose! After getting ready and making sure I looked as nice as I could possibly be in a rush it was time for me to hurry up and wait. My friend Edward (who snapped the picture above) took “the wrong turn at Albuquerque” and ran late. While waiting I could have eaten lunch but my mind was preoccupied with a race of thoughts and feelings sweeping through my mind. When my friend finally drove up we had no time to lose because we didn’t want to hit the crowd of people that was sure to be there and did eventually show up.